Would you like to add more magic to Minecraft PE? Wizard addon is a small addition that brings 3 new mobs as well as magic items. Like all other addons this one changes standard creatures, and some things. So you will meet wizards, better do not touch them otherwise you can regret it. The most aggressive are the dark minions attacking everything alive around but they are rather weak compared to the wizards. Try to spawn these mobs side by side and you'll find out who is stronger. What kind of magician does not have a magic wand? The Wizard addon adds a special staff allowing you to create a lightning bolt. The only one lightning can destroy anyone who you do not like. And of course, there is a magic mantle that turns a player into a real wizard. 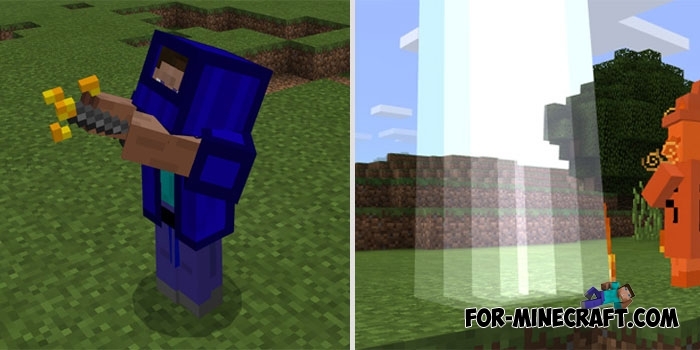 Minions mod v4 for Minecraft PE 1.0.0/1.1Minions are excellent assistants who will be added to your game..